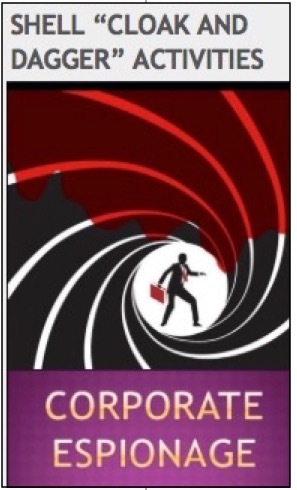 Titled Shell directors, the late Sir Peter Holmes, and Sir William Purves were also directors, major shareholders and the spymasters of Hakluyt & Company, a UK corporate espionage firm founded by former senior MI6 officers. 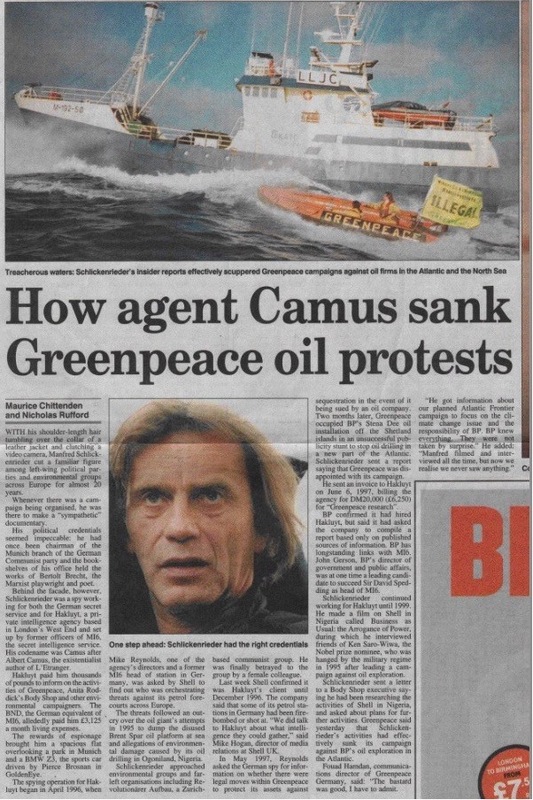 Shell used Hakluyt to engage in cloak and dagger operations against its perceived enemies, including Greenpeace, as exposed in a Sunday Times front page lead article “MI6 ‘firm’ spied on green groups.” It led to a follow-on inside page headlined “How agent Camus sunk Greenpeace oil protests”. When Shell first instigated a cloak and dagger operation against us, we had no knowledge of the oil giants long-time involvement in the dark arts. I first mentioned the subject of investigative activity in a letter dated 15 June 1998 that I sent to Dr Chris Fay, the then Chairman & Chief Executive of Shell UK Limited. It was also copied to Shell lawyers. Since the previous litigation commenced in 1994, it means that the investigative activity instigated by Shell kicked off over two decades ago. It became more visible in 1998 in the run-up to the then pending Shell Smart High Court trial. Our case against Shell, including witnesses and evidence, was the subject of undercover activity. Witnesses were interviewed by an undercover agent posing as a journalist. The same person also gained access to our evidence under false pretences. Evidence was scrutinized and tampered with during a series of what the police unofficially concluded were targeted burglaries. Such clandestine activity was totally at odds with the pledges of honesty, integrity and openness in all of Shell’s dealings set out in Shell’s much trumpeted General Business Principles. I reminded Shell directors many times about the failure to uphold the claimed principles. I did so for example in a letter I circulated to all directors of Shell Transport and Trading Company Plc at their home addresses e.g. this letter to Sir Peter Holmes MC dated 23 April 1998. It was sent just days after serving a breach of confidence writ on Shell in respect of the Shell Smart Loyalty card scheme. I also supplied the multipage feature that had just been published in Marketing Week magazine – “High Court Papers unveil ‘secret’ Shell writ losses”. Sir Peter (now deceased) was a former Chairman of the Royal Dutch Shell Group and had remained as a non-executive director. I had no idea at the time that he, and a fellow titled director of Shell Transport and Trading Company plc (Sir William Purves), were also the spymasters, directors and major shareholders in Hakluyt, a London-based corporate espionage firm set up partly by Shell and BP and staffed mainly by former MI6 officers. In 1995, Shell International was one of Hakluyt’s first clients (page 143 of the Lubbers book). According to information on pages 9, 144 and 145, the information gathered by the cloak and dagger activity was used to develop corporate counterstrategy, including bringing a counterclaim lawsuit. This is exactly what happened in our case. After gathering evidence Shell brought counterclaims in June 1998 against Don Marketing UK Limited, my father, and against me. I will return to the subject of Hakluyt later. It was designed to undermine support for critics of Shell’s policy of propping up the despised racist apartheid regime in South Africa. On page 67, Lubbers reveals that Shell had secret meetings with church delegates. The last paragraph of Page 74 sets out how Royal Dutch Shell tried to publicly separate itself from the activities of Shell Oil Company in regards to the Neptune Strategy, but evidence showed that this was just a deception. We have evidence of similar deception by Shell Oil Company and Royal Dutch Shell Plc in relation to an email I sent to Bill O’Reilly of Fox News about Shell sanctions-busting in relation to Iran. On 12 September 2001, under the headline: “No Secret’s Safe From These Sharp Eyes”, The New York Times published an article focused on corporate “cloak-and-dagger escapades.” Mr Stephen J. 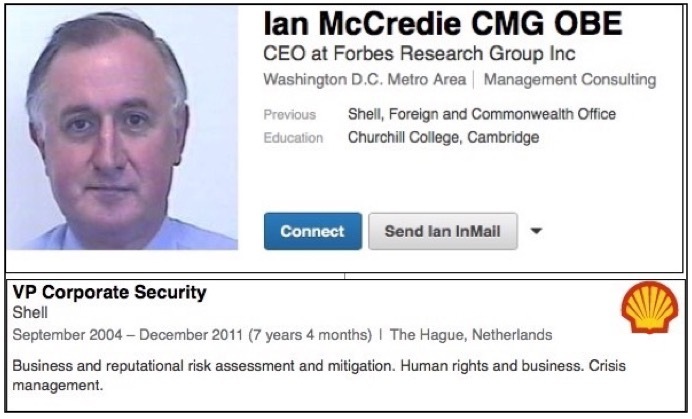 Wade, an executive of Shell International Exploration and Production, a Royal Dutch/Shell Group business, was revealed as being a “competitive intelligence analyst” – a corporate spy. The report said that Mr Wade “uses every trick in the book” and “may even dish out erroneous information…” Mr Wade was quoted as commenting: “It isn’t James Bond.” The article went on to say: “Still, like any good spy, Mr Wade declined to give detailed examples of information gleaned this way”. It also pointed out that corporate spying “sometimes skirts ethical bounds”. A gentleman called Mr Charles Hoots contacted my solicitor, Mr Richard Woodman of the City of London law firm Royds on Friday 15th May 1998. He purported to be a journalist representing “The European” newspaper. Mr Hoots phoned me shortly thereafter from Paris using the same cover story. He had visited our website and wanted to write an article for The European about the litigation with Shell. He asked to meet me on Monday 18th May. I offered to travel to London but he insisted on coming to Bury St Edmunds so that he could interview me at my office or my home. I had lunch with him at an expensive restaurant. The wine flowed freely. Hoot’s paid the bill. He seemed to have a generous expenses allowance. I became suspicious and telephoned Lynn Moorlen, the editor of The European. She was shocked at hearing the claim made by Mr Hoots that he was representing her newspaper. She did not explain what had happened to end the relationship two years earlier, but it was plain that she wanted nothing more to do with Mr Hoots. A UK national newspaper, The Guardian, subsequently investigated Mr Hoots. A journalist at the paper, Mr Paul Brown told me that Charles Hoots had not written any articles for some time and that in their opinion he was probably a “spook” (his term) working under the cover of being a journalist. There is evidence to suggest this analysis was correct. An agent using the name “Christopher Phillips” made an undercover visit to our business centre offices in Bury St Edmunds. He was spotted by an office administrator, Marie Neal, inspecting the pigeon holes used for storing arriving mail. This act, combined with the scope and unusual nature of his questions about us raised her suspicions about the true purpose of his visit. In response to a challenge about his snooping, he presented what turned out to be fake credentials for a sham firm called “Cofton Consultants”. On Tuesday 9th, June 1998, my solicitor, Mr Richard Woodman, received a telephone call from a Mr. “Daniel Wilson,” who claimed to be representing The Daily Express newspaper. Mr Wilson said that he had visited our website. He had originally intended to write a story about the way that the Internet was used in the “McLibeI” case. He now intended to focus on our story. The article would be published the following day, Wednesday 10th June. He repeatedly pressed Mr Woodman to answer some questions about the litigation. Mr Woodman refused to do so. Mr Wilson left a telephone number for me to call. When I did so, it became apparent that the number did not exist. I telephoned The Daily Express and spoke to several people. None had ever heard of Daniel Wilson. No article was published about websites in the paper on the date quoted. “Mr Wilson” never called again. 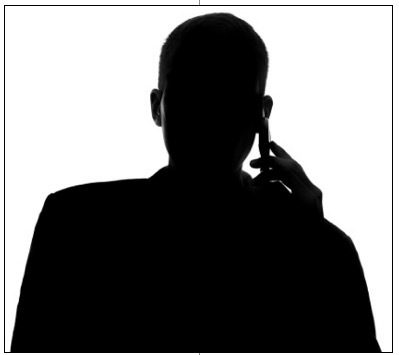 I received a telephone call from a different gentleman who refused to disclose his name. When I stated that I was not prepared to hold a conversation on that basis, he indicated that if I gave him a few minutes, it would become obvious that he had an intimate knowledge of the litigation and associated events. I would learn something to my advantage. Intrigued by his introduction, I listened to what he had to say. An account of the call was contained in a letter my father sent to Royal Dutch Shell Group Chairman Mark Moody-Stuart in November 1998. (centre screenshot). In June, threats were made against my family and potential key witnesses, during an anonymous call from a London payphone. Shell UK Legal Director, Mr Richard Wiseman, denied that anyone at Shell had any connection with the incident. However, It was evident from his subsequent actions that he had doubts about the veracity of his denial. Details about the call, including the location of the payphone, were uncovered as a result of Investigations by the Police, a BT Investigations Unit, and a national newspaper, The Guardian, which obtained and examined closed circuit TV videos from a local bank. Unfortunately they were unable to identify the caller. The anonymous caller had inside knowledge of Shell’s secret plans to go on the offensive against us. He not only disclosed that Shell was about to bring a Counterclaim, he even mentioned the grounds on which it was subsequently brought. Beyond any doubt, the caller was someone closely involved with Shell. Mr Wiseman evidently concluded that this was the case, as he launched an internal investigation at Shell-Mex House and personally Interviewed AJL, the key Shell manager in all of the four High Court Actions my son has brought against Shell (three of which Shell has already settled). The accuracy of the Information the caller disclosed was clearly designed to prove his credibility and the potency of his threats. I confronted Shell about the sinister activity. 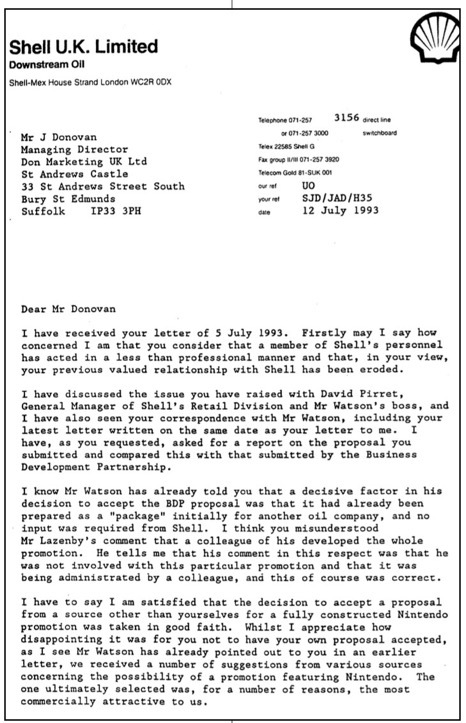 On 15 June 1998, I faxed a letter to Dr Chris Fay (right), the then Chairman of Chief Executive of Shell UK Limited (centre screenshot). I sent copies to Mark Moody-Stuart, Richard Wiseman and Colin Joseph of DJ Freeman. I set out in the letter the disturbing events that had taken place, involving Charles Hoots, Christopher Phillips, Daniel Wilson and the anonymous call. The letter mentioned Mr Hoots and the anonymous call. There was no mention of Daniel Wilson or Christopher Phillips and no admission that Shell had any connection with ANY of the sinister events that led me to call in the police. On 18 June, my solicitor, Richard Woodman, faxed a letter to DJ Freeman, which put Shell in a corner. We enclose for your information a letter which we have sent to a Company called Cofton Consultants, the contents of which are self-explanatory. 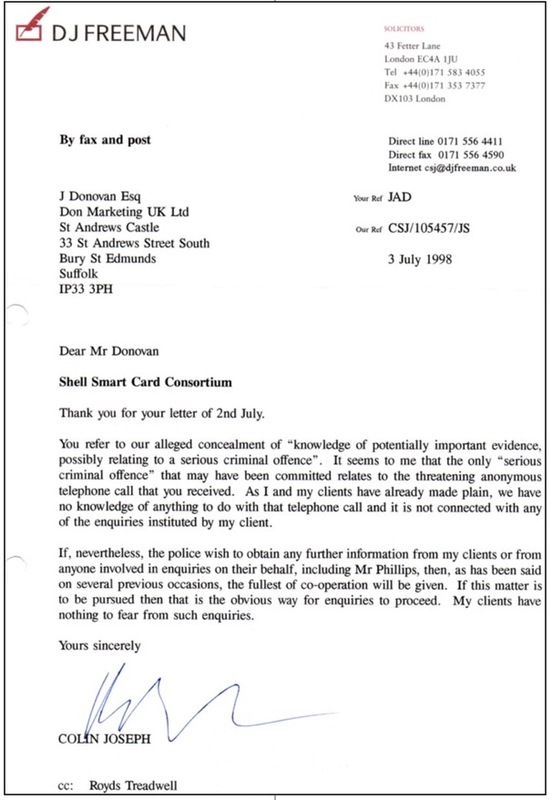 We should be most grateful if you could confirm that Shell has and never has had any connection with this Company whether in relation to John Donovan, Don Marketing UK Limited, the current or past litigation, or in any other respect. The following day DJ Freeman faxed a response to me admitting for the first time that both DJ Freeman and Shell were aware of Christopher Phillips and claimed he was making “routine credit enquiries” in connection with the litigation. There was no indication of who issued the brief, DJ Freeman or Shell. In the same letter, Shell’s solicitors said that neither they nor Shell had any knowledge of the other incidents. They made particular reference to the anonymous call. If “routine credit enquiries” were indeed the sole ambit of the brief given by your firm to Cofton Consultants then perhaps you would supply us with a copy of your letter of instruction so that everyone can be satisfied about what you say. Neither do we accept that such enquiries are “normal” in litigation. As you can imagine we have taken detailed instructions from our Client about the extremely disturbing anonymous telephone call he received ten days ago. We are entirely satisfied that this call could only have been made by someone connected with your Clients or fully briefed by them. The caller accurately informed John Donovan that your Clients were using private enquiry agents, accurately informed John Donovan that your Clients had retained the services of Shandwick Public Relations and Tequila (both of whom have recorded a number of visits to our Client’s website); accurately recounted the events which had taken place at Shell’s AGM; and (probably) accurately recounted Dr Fay’s anger on that occasion. The caller also stated that your Clients were “fed up with” the campaign which supports the litigation (particularly the “colourful website”) and threatened that if this continues not only would the litigation prove financially ruinous to Mr Donovan, he and his family would be “endangered”. So far as the visit of Mr Phillips is concerned, and his instructions, we will, as D J Freeman have said, co-operate with the police to the utmost extent. Despite the seriousness of the situation, we were never given sight of the brief issued in respect of the visit by “Christopher Phillips,” who obtained information under false pretences, using fake credentials. 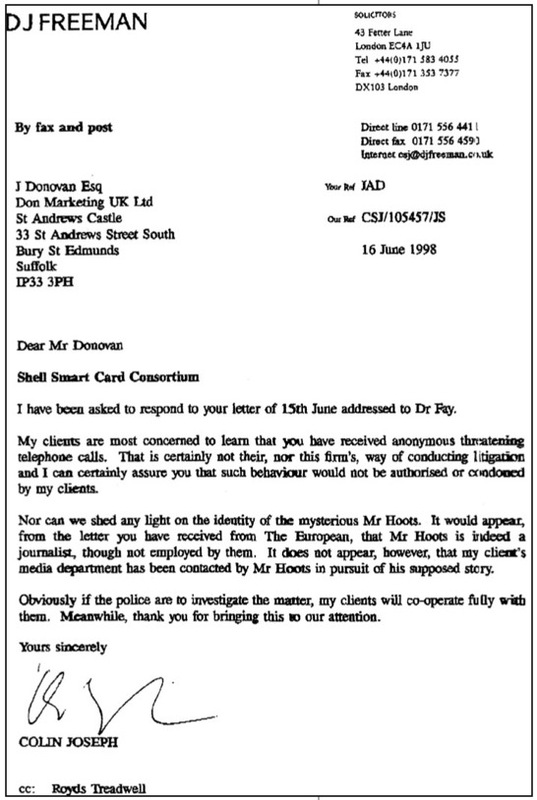 Colin Joseph made it plain in a letter dated 3 July 1998, that Phillips was not the only person involved in making enquiries on Shell’s behalf. If, nevertheless, the police wish to obtain any further information from my clients or from anyone involved in enquiries on their behalf, including Mr Phillips, then, as has been said on several previous occasions, the fullest of co-operation will be given. The revelation that Phillips was apparently just one of an undisclosed number of agents making enquiries was intimidating and no doubt deliberately meant to be so. Shell lawyers were unwilling to disclose how many agents were involved, or what they were doing on Shell’s behalf. The excuse given of making “routine credit enquiries” did not stand up. Routine credit enquiries can be made instantaneously using modern technology. The questions Phillips asked staff about us had nothing to do with credit enquiries. Their agent was clearly engaged in gathering information about my family and me, asking for example about the purpose was of our visits to the USA. The initial underhand activity soon turned into something even more sinister. My main witness, Mr Roger Sotherton (right), returned home one evening to discover that his house had been burgled and that someone had examined his files on the case. When I reported this astonishing development to my solicitor Richard Woodman, he shocked me by revealing that his home in South London had also been burgled in similar circumstances. A short time later, on 13 October 1998, my house was also broken into. Nothing was taken. Documents were tampered with. The burglaries were referred to in the aforementioned letter my father sent to Mark Moody-Stuart in November 1998. Personal and company bank statements for Don Marketing and its current and former Directors have also been examined. Such information goes beyond the bounds of “routine credit enquiries. One burglary was carried out at a house that Mr Hoots was keen to visit. The Police have been notified of the burglaries and of the circumstances linking all of them. My father received a response letter dated 26 October 1998 from DJ Freeman on behalf of Moody-Stuart. It was dated 26 October 1998, but this must have been an error as the first line stated: “We have received your letter dated November 1998 addressed to Mr Moody-Stuart.” Presumably, the date should have been 26 November 1998. It confirmed that Shell had carried out an internal investigation into the threatening call and also indicated that Shell only became aware of the burglary at the home of Roger Sotherton after being contacted by a Guardian newspaper journalist. Some of these events were set out at the time in a letter dated 23 November 1998 my father sent to Colin Joseph. Although I lived in Suffolk and Roger Sotherton lived in Norfolk, the police sent the same forensic’s team to both locations. 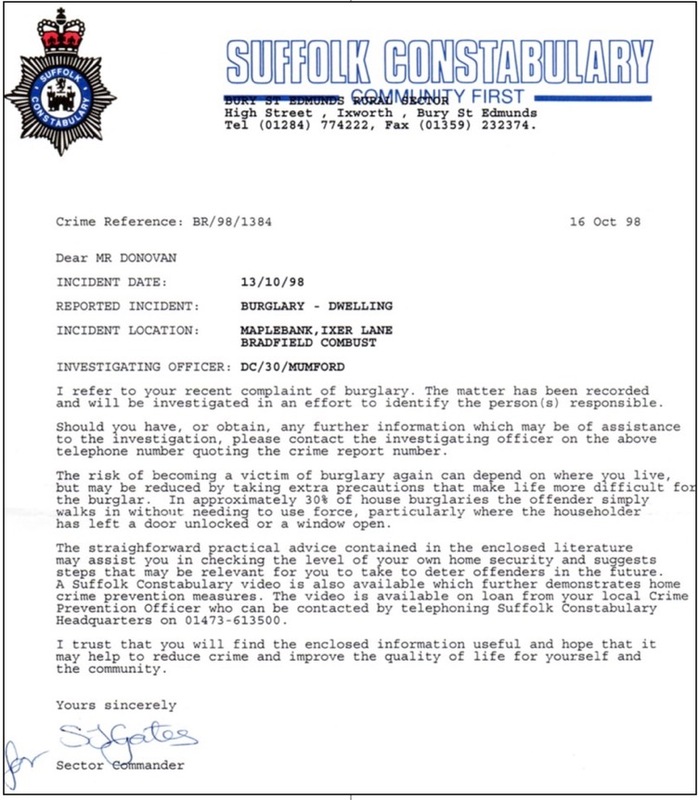 I received a letter dated 16 October 1998 from a Sector Commander of Suffolk Police, S J Gates, supplying information, including a Crime Reference code. All of the burglaries across Southern England took place within a matter of weeks leading up to the 1999 trial in which counter-claims were brought against us, later abandoned by Shell. The police investigated the series of events including the anonymous telephone call. They interviewed staff at Shell-Mex House, including AJL. The police discussed setting a trap at the home of Mr Paul King a retired Shell National Promotions Manager. They thought Mr King might also be targeted. The Police eventually advised me off the record that despite concluding there had been a criminal conspiracy against us, there was insufficient evidence to prove it. Shell and DJ Freeman did, however, after being cornered, admit in writing the activities of Christopher Phillips. As is evident from the letter I received from Richard Wiseman dated 1 July 1998, Mark Moody-Stuart and Dr Chris Fay were both in the loop regarding the discussions about the undercover activity. It would not be surprising if the incidents frightened my key witnesses. The burglary activity did have an impact on the trial. Roger Sotherton, whose evidence was crucial to my case, was not his normal self when giving evidence. His memory was called into question because he could not recall something that had happened a few days earlier during the trial. When pressed at one point in his cross-examination, he testified under oath that Shell papers in his possession were tampered with during the burglary at his house. He also referred to the burglaries at the homes of other people involved in the litigation. He was clearly shaken rigid by the series of sinister events. See highlighted in yellow extracts from the official transcript of Roger Sotherton being cross-examined by Geoffrey Hobbs QC acting for Shell. A very nervous Mr King, who had expressed reservations about the ethics of AJL and Shell, declined to give evidence on behalf of Shell or me. He expressed concern about retaining his Shell pension. A handwritten letter he sent me a few years earlier after his retirement from Shell when he indicated that Shell was no longer the company he had joined, was, however, entered into evidence. By the time of the trial, the evidence of all of my potential key witnesses was undermined, neutralized or not given at all, due to the intimidating nature of the sinister events. Links for the entire correspondence. I strongly suspect, but cannot prove, that additional activity was arranged at a much higher level. 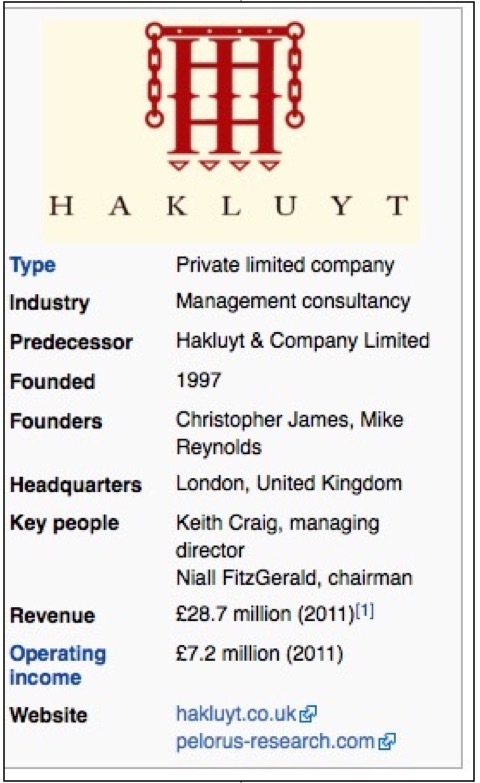 Hakluyt is a corporate intelligence company based in London founded by former senior officers of the British Secret Service, in close association with titled Shell directors. As mentioned earlier, I had no idea when the cloak and dagger activity was in progress that Shell directors were at that time, also the spymasters, directors and major shareholders in Hakluyt. Sir Peter Holmes was President of the Hakluyt Foundation, which supposedly had an oversight function on the spying operations while Sir William Purves was Chairman of Hakluyt & Company Ltd. In view of their personal involvement with Hakluyt, these two Knights of the realm were no doubt amused by our vocal public complaints about the spying relating to our litigation against Shell. A Hakluyt director is on record as stating that it is their normal modus operandi to bring in operatives from overseas to engage in spying/intelligence gathering activities. The undercover agents then conveniently leave the legal jurisdiction in which such activities have taken place. 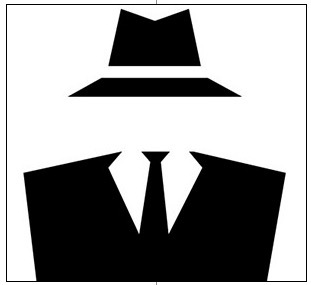 Hakluyt sometimes uses serving secret service agents who carry out assignments on a freelance basis. Hakluyt also uses investigative journalists for intelligence gathering activities – a perfect cover. See this article from July 2008 about Hakluyt recruiting journalists as spies. According to the aforementioned Lubbers book (page 142): “Each associate is given different questions and works independently”. At its centre lies a British-based private intelligence firm, with close links to MI6 – and distaste for any sort of publicity. It emerged that Hakluyt had employed a German spy, who posed as a left-wing sympathiser and film-maker, in order to betray plans by Greenpeace against oil companies. 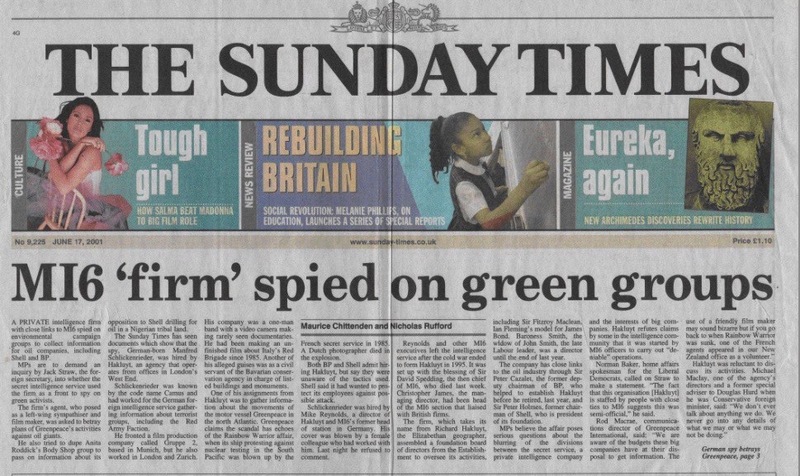 The affair left MPs questioning whether secret intelligence services used the firm as a front to spy on green groups. Hakluyt has denied claims by some in the intelligence community that it was started by MI6 officers to carry out “deniable” operations. Remember, I knew nothing about Hakluyt during the period when the litigation was in progress – the period when the sinister events took place. 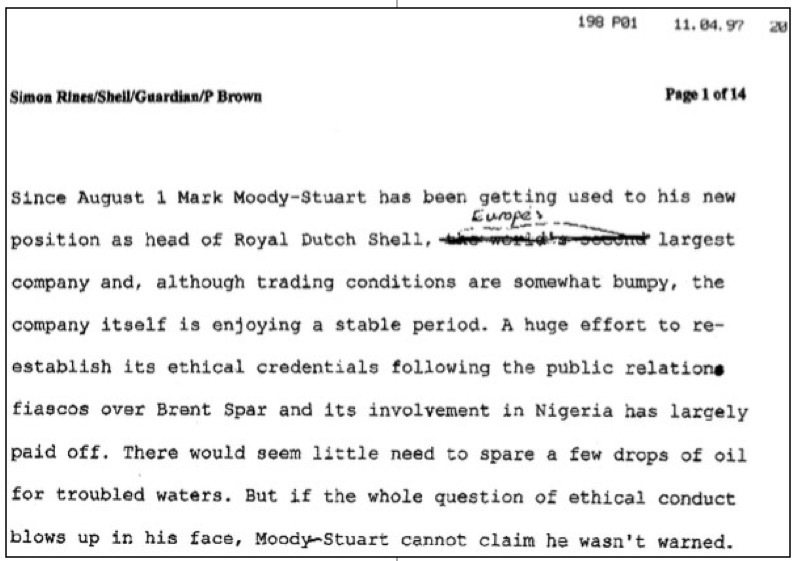 It is relevant to note that two years later, The Sunday Times ran a front-page lead story about Shell/Hakluyt espionage operations conducted on an international basis against Shell’s perceived enemies, including Greenpeace, The Body Shop and Nigerian activists. See “SHELL CONNECTION WITH HAKLUYT & COMPANY LIMITED.” Also, a link to a PDF version of Sunday Times front page article on 17 June 2001 exposing these activities. 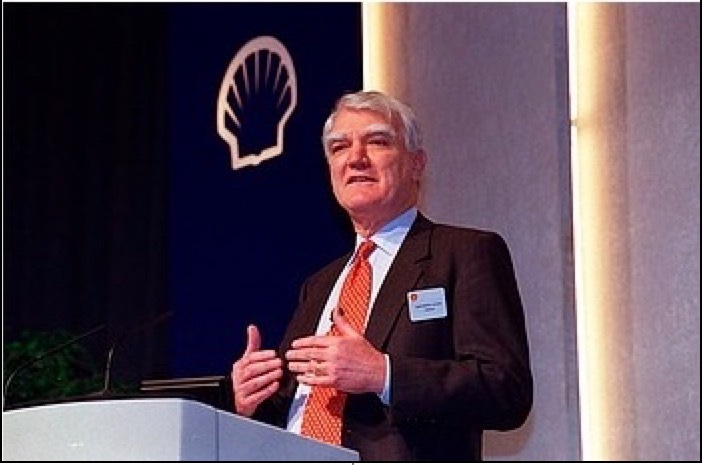 Sir Peter Holmes and Sir William Purves were both listed as being in attendance at the Shell AGM in 1995. They heard a public exchange between my father and Sir John Jennings during the Q&A session. On page 146 of the Eveline Lubbers book, several examples are provided of Hakluyt making denials that proved to be completely false. Hakluyt only made admittances when confronted with irrefutable evidence of their involvement. In all other circumstances, it seems they are happy to lie. Lubbers also confirmed that Shell is still a client of Hakluyt. The bizarre circumstances of our dealings with the then Hakluyt Managing Director (a former senior MI6 officer,) and the letter we received from him, carefully crafted by a titled lawyer, Sir Anthony Hammond KCB QC – only added to the intrigue. More on this later. Mr McCredie is closely associated with Hakluyt. When I sent an email to him at Shell, I received a response from his Hakluyt email address. 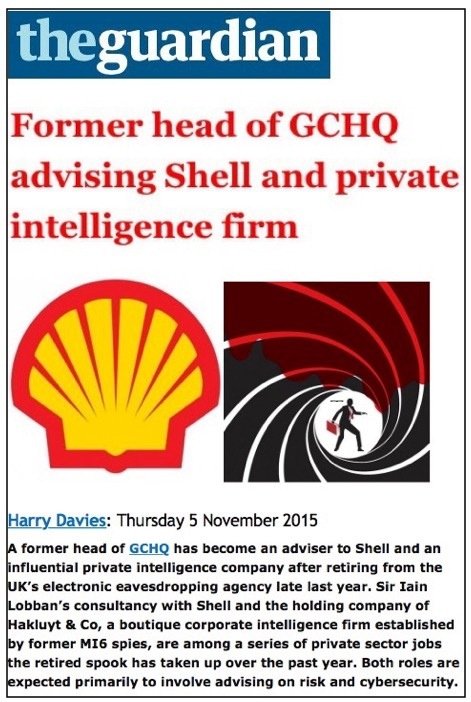 His spook duties at Shell were listed in his CV published online (as of October 2015). See box below. A retired senior FBI official, Richard T. Garcia, was Global Security Manager for Shell Americas. A very senior person within Shell Global Security, another former spook, contacted me with insider information and confirmed that he was involved in monitoring my website activities. I have all of the correspondence with this individual. Mr Hoots came to the UK specifically to gather information about my case against Shell and incurred substantial costs. He never approached Shell to find out their side of the story, only my solicitor, my witnesses and me. He never published an article. He used false pretences when speaking to all of us and gained access to an array of documents. I later found out that his modus operandi was entirely in keeping with the common method of operation by undercover agents engaged in corporate espionage. Other parties have been the victims of alleged spying activity by Shell. Mr Laurie Flynn, a former producer of the UK TV investigative documentary World in Action, confirmed to me the accuracy of these allegations. Pressure was successfully applied by Shell to prevent the documentary feature being aired. In the summer of 2008, Shell was accused of being responsible for surveillance operations directed at members of the local population in Ireland protesting against the Shell led Corrib Gas Project. The story was covered in The Irish Times and elsewhere. As was confirmed in a Guardian newspaper article published on 5 November 2015, Shell’s close association with Hakluyt & Company continues. I am able to provide an overview from an independent journalist on how matters looked in April 1997. It is in the form of a 14-page draft Guardian/Observer Newspaper article authored by Simon Rines, as faxed to John Donovan on 11 April 1997. Mr Rines wrote for many marketing magazines as well as for The Telegraph, The Observer, and The Sunday Business. Neither Mr Rines or The Guardian Media Group have been notified about the publication of his draft article for The Guardian, which means that it is not published with their advance knowledge or with their prior consent. The draft was circulated to me and the aforementioned Mr Paul Brown, a correspondent for The Guardian who now teaches journalism. I have inserted the initials AJL instead of the name of the then National Promotions Manager at Shell U.K. Limited. As can be seen in his draft article, Mr Rines did investigative the anonymous call and with the aid of British Telecoms special investigations unit found the phone box in London from where the call was made. Events turned even more sinister soon after the date of the draft article, with the series of burglaries. In a subsequent faxed communication, on 14 May 1997, Mr Rines expressed concern about possible additional espionage activity being directed at us. He suggested that certain security measures should be implemented. Neither he nor I had a clue at that time about the clandestine activities of Hakluyt & Company. We had never heard of the spy-firm. Shell kept silent about Hakluyt, even during a meeting with Mr Rines on 10 September 1998 at Shell-Mex House attended by Mr Wiseman, Mr Joseph of DJ Freeman and a representative from Shell’s media department. Some judgment can be made on how sensitive the subject was by the fact that both sides tape-recorded the entire interview. Shell did not reveal the Hakluyt connection. A letter my father sent to Colin Joseph on 23 November 1998 makes reference to the meeting and what was discussed. The bold highlighting is by me. Since August 1 Mark Moody-Stuart has been getting used to his new position as head of Royal Dutch Shell, Europe’s largest company and, although trading conditions are somewhat bumpy, the company itself is enjoying a stable period. A huge effort to re-establish its ethical credentials following the public relations fiascos over Brent Spar and its involvement in Nigeria has largely paid off. There would seem little need to spare a few drops of oil for troubled waters. But if the whole question of ethical conduct blows up in his face, Moody-Stuart cannot claim he wasn’t warned. The source of ignition is not an environmental pressure Group or questionable involvement with a political regime, but Suffolk businessman John Donovan and his 81 year old father, Alfred. The case involves a litany of deceptive behaviour, downright lies, broken promises and incompetence on behalf of Shell. It has already paid out over a £X million pounds in damages and £X in costs to Donovan. It has resulted in one in ten Shell UK forecourt traders joining an anti-Shell pressure group, disruption at two of Shell UK’s AGM’s and Moody-Stuart has had to stand by and watch as Donovan has placed highly embarrassing advertisements in the trade press and set-up an equally damning website. In the latest round of battle, the stakes are higher than ever prompting Shell’s solicitors to send a clandestine investigator to Donovan’s business premises. Most alarming, however, is an anonymous phone call Donovan received warning him to lay off Shell or the consequences to him and his family would be dangerous. The story begins in 1983 when John Donovan, managing director of Don Marketing, persuaded Shell that he had devised a legal version of the forecourt promotion Make Money that Shell had originally run in the 60’s but withdrawn on police advice that it contravened the lotteries act. Shell agreed with Donovan and ran Make Money, the basis of which was to collect two halves of a specified denomination note to claim a reward of that value. In marketing terms, it was a sensation. Forecourt sales rose by 30%, people were placing ads in newspapers to get the missing halves and Don Marketing won an Institute of Sales Promotion award for the campaign. There then followed a long and successful relationship between the two companies until 1992 when Shell appointed AJL as national promotions manager. Initially Donovan saw no problem in working with AJL and briefed him on a raft of new marketing ideas over an eight-month period. The briefings were ‘in confidence’, a clause which effectively ensured that Donovan retained the legal rights to the ideas. “I first became aware that things were amiss one morning in June 1993 when I opened my newspaper to see an advertisement for Shell’s Nintendo promotion” says Donovan. Donovan immediately went out and collected some of the ‘instant win-scratch off game pieces’ and discovered that although the design differed from his proposals, the concept was almost identical. Donovan also noticed that many of the latex scratch off coverings were too thin, making it possible to read through the material. When later challenged on this point, AJL said that he didn’t care because the top prize was worth only about £70. In other words, staff at filling stations were able (using friends or family) to claim many of the prizes and Shell’s national promotions manager was unconcerned. Donovan phoned AJL pointing out that Nintendo was his idea and pressed for a settlement without resorting to the costly and, for Shell, embarrassing recourse to legal action. A discussion also took place on the subject of re-running Make Money in which Donovan pointed out that the two companies had equal rights. In response to this point AJL said: “I don’t care about that. If we want to run Make Money again, then we know how to do it”. 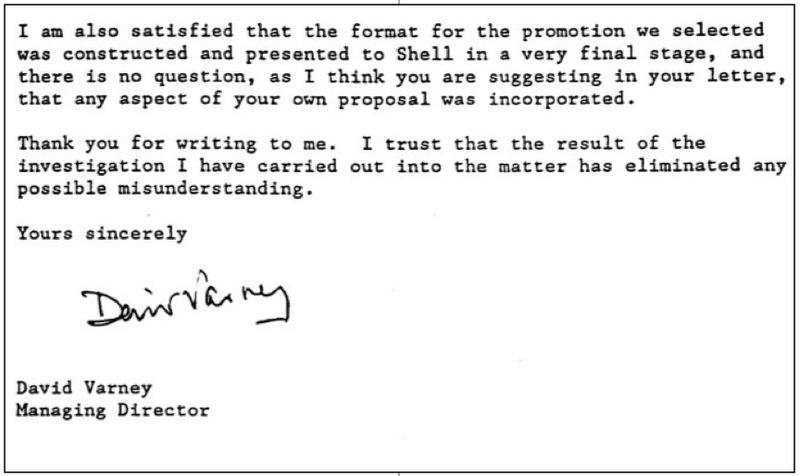 In July 1993, Donovan wrote to the managing director of Shell UK, David Varney (now chief executive of Transco) to complain about AJL’s behaviour and to seek an internal investigation into the matter. Varney’s reply stated that he had personally undertaken an investigation and that AJL had no involvement in the Nintendo promotion, implying that he could not have stolen the idea. The whole letter was a pack of lies. 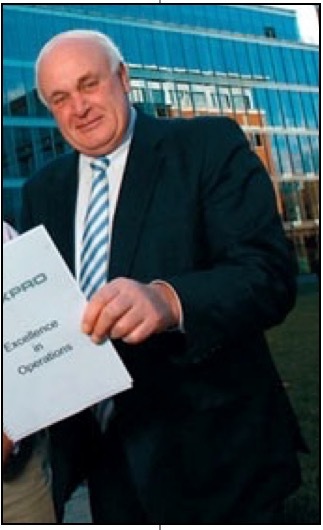 It later emerged that marketing and communications manager David Watson had undertaken the investigation, that AJL had a major role in Nintendo, and that the letter far from being written by Varney, was actually drafted by Watson and AJL – Varney had merely signed it. The matter dragged on until February 1994 when in, a further telephone conversation with AJL, Donovan became suspicious of evasive answers on the subject of re-running Make Money. When challenged directly on the matter AJL again responded evasively: “If we want to do something in a year’s time then we’d have to get it resolved at that stage”. Using contacts in the industry Donovan discovered that Make Money was in production and challenged Shell’s legal department who denied the allegation. Don Marketing saw no option but to issue a High Court writ. Within 12 days Shell was ready to settle but offered a ten minute ultimatum to Donovan – either accept a £60K settlement or the company would scrap Make Money and run another promotion that was also at an advanced stage of preparation, in which case Don Marketing would get nothing. Donovan agreed, but later discovered that the alternative promotion was ‘Now Showing’, based on another of his ideas. Had he known this he would not have settled for what he considered an inappropriate sum. When Shell did run Make Money in April 1994 it was, again, a flawed promotion because it was possible to see through the envelopes leading to the same potential abuses as with Nintendo. Donovan used this information to his benefit. In exchange for his silence on the matter, Shell agreed to mediation on the Nintendo dispute. Donovan suggested that, a high ranking member of Royal Dutch, John Smeddle, whom he trusted, be arbitrator. But when mediation began Shell UK had broken the agreement because there was no one present who had the authority to compromise the action. Everyone’s time, including Smeddle’s, for whom Donovan still has high regard, was wasted. In the meantime Shell had launched Now Showing. Donovan issued High Court writs covering both Nintendo and Now Showing and a lengthy legal dispute entailed. In this time he became a Shell shareholder and, with his father, set up the Shell Corporate Conscience Pressure Group which, at one point, had over 10% of forecourt owners as well as Shell shareholders as members. Apart from Donovan’s dispute with Shell the group also aimed to highlight concerns being expressed by franchisee’s in their dealings with the company. The group conducted surveys of the franchisees in which 89% of those responding said that they would not recommend any petrol retailer to switch to Shell and 91% said that Shell’s management should resign. 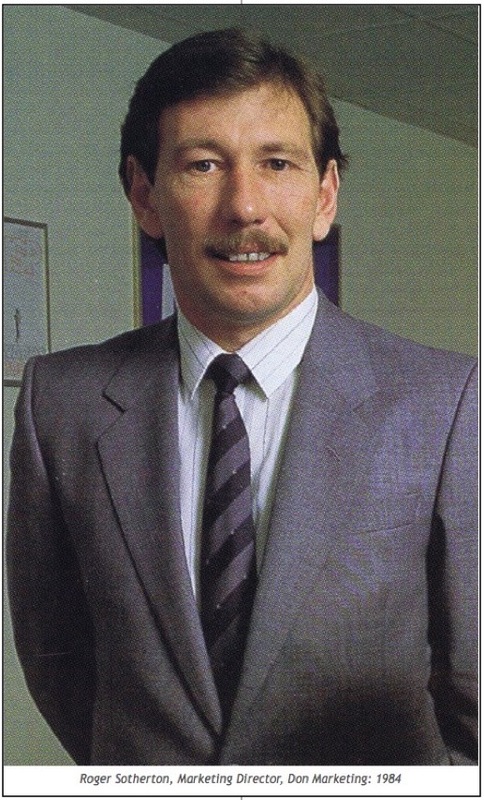 The results were published in a full-page advertisement in trade publication Forecourt News in May 1995. “I felt that Shell was using its strongest weapon, the ability to make litigation expensive and lengthy, to the full.” Says Donovan. 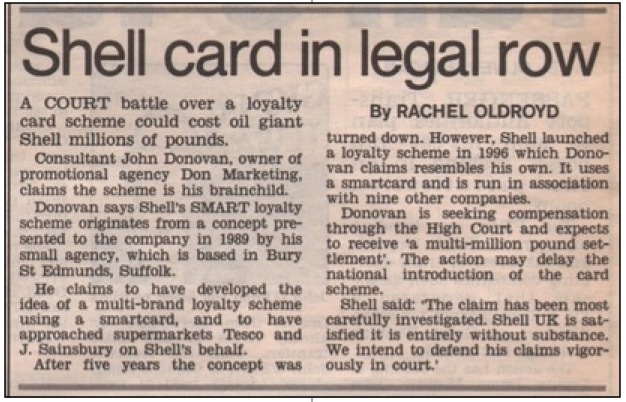 In the meantime Shell had launched a new card based loyalty programme, Shell Smart in October 1994. In March 1997, however, a new, multi-partner version of the scheme was launched in Scotland. “1 immediately recognised it as almost identical to the plans I had first put to Shell in 1989.” Says Donovan. Donovan wrote to Dr Fay who refused to enter into correspondence and put the matter in the hands of Shell’s solicitors. Donovan put proposals for binding arbitration to Moody-Stuart (then, as now, Chairman and MD of Shell Transport) which were rejected. He then spent a year gathering evidence and corresponding with Shell. He finally issued a writ in April this year alleging breach of contract and misuse of confidential information over the Smart scheme. If Donovan succeed’s he stands to make millions because, unlike the previous claims, for short-term ‘tactical’ promotions, Smart has an unlimited life span and is now running in nine countries. If Smart is introduced to the US market where, in a similar case against General Motors, the litigant was recently awarded $24 million in damages, any settlement in Donovan’s favour could be astronomical. Donovan issued a writ for libel on the grounds that the statement implies that his previous claims were without merit and that the Smart claim is bogus. Shell sought to have the libel writ struck off, but in a preliminary hearing in July, this was rejected and Shell was ordered to pay costs. To keep the pressure on Shell, Donovan set up a website in April that pulls no punches. He has also published leaflets and his father had a slanging match with Moody-Stuart at Shell’s recent 100th anniversary AGM. More recently Donovan placed an advertisement in Forecourt Trader warning Shell retailers that they too could face prosecution if they run Smart. Further advertisements have been placed in the marketing trade press warning existing and potential partners of Smart that they could face legal action. The past few months have also seen a series of strange approaches to the Donovan camp. In May, a Paris based journalist, Charles Hoots, contacted Donovan claiming to be from The European and wanted to discuss the case. He then travelled to Suffolk from Paris, and questioned Donovan and a colleague over several hours including a lunch costing £90 that he insisted on paying for. In all he had spent several hundred pounds and had put a lot of effort into the story but, although he had freelanced for The European two years ago, he had no current commission nor has he ever contacted the paper on the matter. Similarly a ‘Daniel Wilson’ phoned Donovan’s solicitor claiming to be from The Express’ and wanted to discuss the website. He left a number that proved to be a dead line. No one at the Daily Express has any knowledge of him and he has never called back. Then on Sunday June 14 Donovan received an anonymous call at home. According to Donovan the caller had an in-depth knowledge of the case including such details as Dr Fay’s anger following the incident at the recent AGM. Most of the discussion concerned information that is, theoretically, in the public domain although it would have required considerable research for anyone involved to discover. The caller then said that Shell had instructed an investigative resource and that the company was about to go on the offensive. He then mentioned that Donovan should not count on former Shell employees to give evidence and that Shell’s patience with Donovan had run out. He told Donovan that for the sake of him and his family, he would be well advised to withdraw the claims otherwise Donovan would be putting himself and his family in a dangerous situation – he then hung up. The Guardian has since traced the call to a public telephone box on London’s Whitechapel Road just outside the City. The following day Donovan reported the matter to the police and faxed Shell full details of the call and the activities of Hoots, Wilson and ‘Christopher Phillips’. Donovan had learned that morning of a visit by Phillips on May 21 to a business centre used occasionally by Don Marketing as a messaging address and meeting facility. Office administrator, Marie Neal, had first noticed Phillips scrutinising the pigeon holes used for mail when she entered the otherwise empty reception area. When approached, he explained that he was looking for office accommodation for a friend who worked in marketing and was interested to know if there were similar companies in the building. When Don Marketing (being a non-residential client) was not mentioned, he broached the subject of such users. Neal told him of Don Marketing but despite his questioning on its activities, she couldn’t give more details – partly through lack of knowledge and partly through suspicion. ‘Phillips’ gave her a card listing him as a director of Cofton Consultants based in Brompton Road, Knightsbridge. Cofton Consultants is not listed in Companies House, the address is for a secretarial service which Phillips uses as an accommodation address – staff there have no details of a forwarding address or number. Neal had not immediately informed Donovan because she didn’t consider Phillips’ visit significant. 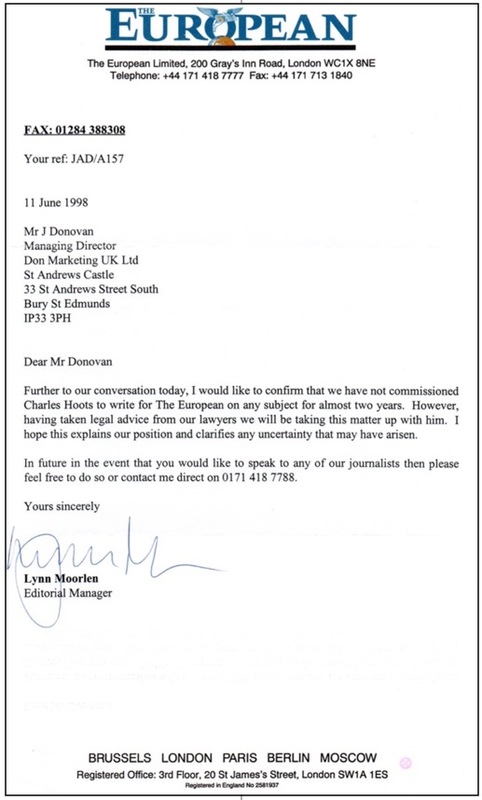 Shell’s solicitors, DJ Freeman responded to Donovan’s fax with a promise to cooperate fully with any police investigation but categorically denied any knowledge of Hoots, or the anonymous caller, although Shell is understood to have launched an internal inquiry into the call. Despite the fact that Donovan’s fax had reported the visit of Phillips and the caller’s reference to an investigative resource, DJ Freeman made no mention of Phillips’ activities. It was only when challenged directly about Phillips later in the week that DJ Freeman admitted his involvement, explaining it ‘was, quite reasonable to establish whether my clients would be covered to receive all their costs from you if they are successful in this action’. Quite how a credit check on Donovan could be made by asking questions unrelated to his financial situation is unclear. The reason given for Phillips’ visit is also undermined by the fact that it is John Donovan, not Don Marketing, who served the writ – Don Marketing’s credit rating is, therefore, irrelevant. Significantly, another aspect of the anonymous call turned out to be accurate in that Shell has subsequently gone on the offensive by issuing a counter claim against Donovan claiming £100,000 for his failure to comply with the terms of the Nintendo/Now Showing settlement. “I don’t seek to hold Shell to ransom for an enormous amount of money and I certainly don’t relish a long legal battle. I have an 81 year old father with a War Disability Pension and a mother, who is also unwell, to look after. I’ve made numerous offers of binding arbitration to Shell but they have refused. Anyone who has met Donovan can see that he is neither paranoid nor obsessive. He is, however, determined and meticulous to the degree of keeping every piece of correspondence (including the envelopes they were posted in) relating to Shell since before the legal wrangles began. Every letter that he or his solicitor has sent in recent years has been copied to senior members of Shell’s management including Moody-Stuart. Despite the enormous number of public accusations that he has made, and the damage that they have caused Shell, the company has so far refrained from issuing a single libel action. Shell’s statement of General Business Principles contains a section on ‘Business Integrity’ which states: ‘Shell companies insist on honesty, integrity and fairness in all aspects of their business’. Considering full details of the case are known to Shell’s senior management, and with AJL still employed by the company, Donovan, for one, finds his experiences hard to square with those lofty ideals. This entry was posted in Alfred Donovan, Bill O’Reilly, Charles Hoots, Chris Fay, Christopher Phillips, Cofton Consultants, Colin Joseph, Geoffrey Hobbs QC, Greenpeace, Hakluyt & Company, Ian Forbes McCredie, MI6, Richard Wiseman, Roger Sotherton, Royal Dutch Shell, Shell, Shell Business Principles, Shell Corporate Conscience Pressure Group, Shell Smart, Shell Spies, Shell Spying, Sir Anthony Hammond KCB QC, Sir Mark Moody-Stuart, Sir Peter Holmes, Sir William Purves, Uncategorized. Bookmark the permalink. This is not a Shell website nor is it officially endorsed by or affiliated with Royal Dutch Shell Plc.